UNNExT Brief No. 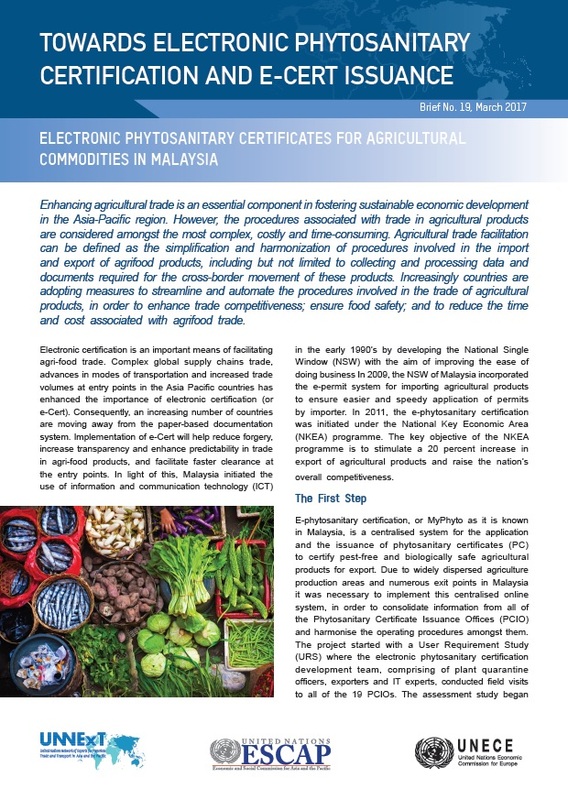 19, Electronic Phytosanitary Certificates for Agricultural Commodities in Malaysia. Electronic certification is an important measure for facilitating agri-food trade. Complex global supply chains trade, advances in modes of transportation and increased trade volumes at entry points in the Asia Pacific countries has enhanced the importance of electronic certification (or e-Cert). Consequently, an increasing number of countries are moving away from the paper-based documentation system. Implementation of e-Cert can help reduce forgery, increase transparency and enhance predictability in trade in agri-food products, and facilitate faster clearance at the entry points. This brief presents the Malaysian experience in implementing an electronic phytosanitary certification system.